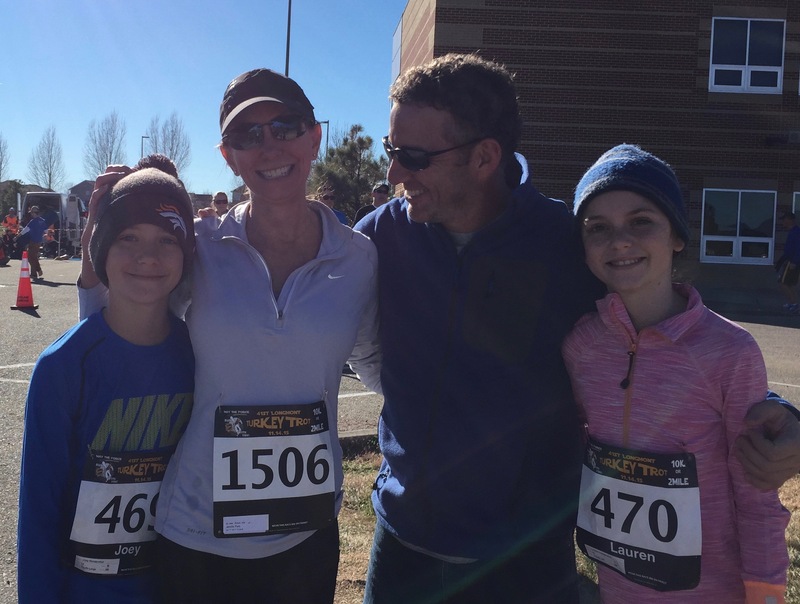 The prettiest family in Prospect showed up in force to run this year’s Longmont Turkey Trot – the Paris-Hendershots. Joey ran a 7 minute pace in the 2 mile event. Half my neighborhood was out running either the 2 mile or 10K today. The weather started out cool, in the 40°s, but warmed up quickly with no wind and full sun. Times were fast with such ideal running conditions. 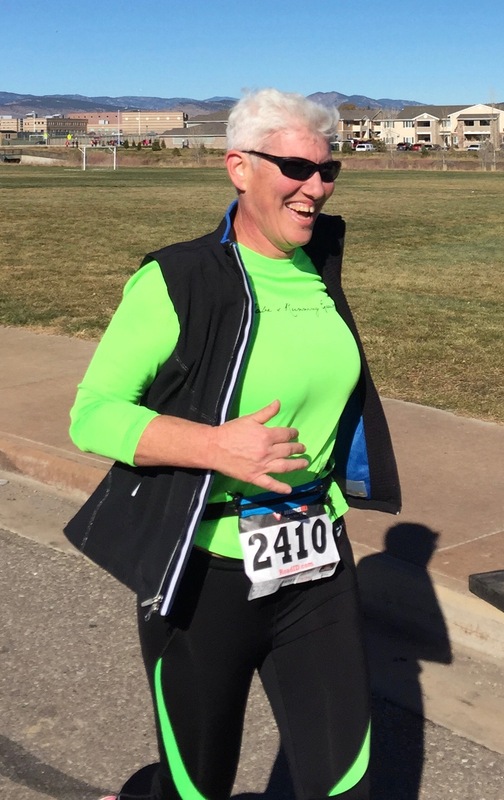 Coach Jabe ran the full 10K, lighting up the course in fashionable green. Keith and I warmed up with a mile before starting out. I’d have warmed up with 2 or 3 miles if planning for a fast start, but I was just looking for a good workout. I was hoping to run a couple of fast miles in the middle, but surprised myself by running a fairly constant pace. The course isn’t the most exciting. It’s a lollipop design that begins running north up a half mile stem, then runs clockwise around a square with one mile long sides, before returning back south down the stem. All through mostly flat farmland. I ran my first 4 miles in 6:58, 6:57, 6:55 and 6:50. Almost perfect consistency while marginally improving. That faster 4th mile taxed me a bit and I slowed down to 7:01 on my 5th mile, while running 6:59 for my final 6th mile. I doubt I’ve ever run a more consistent pace. 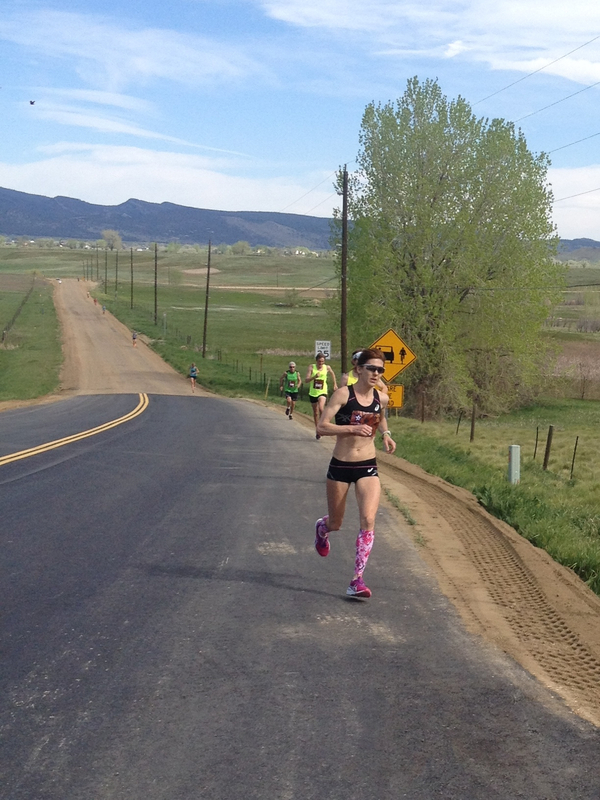 I finished in 43:13, just 3 seconds slower than this year’s Bolder Boulder – yet more consistency for my only two 10Ks in 2015. 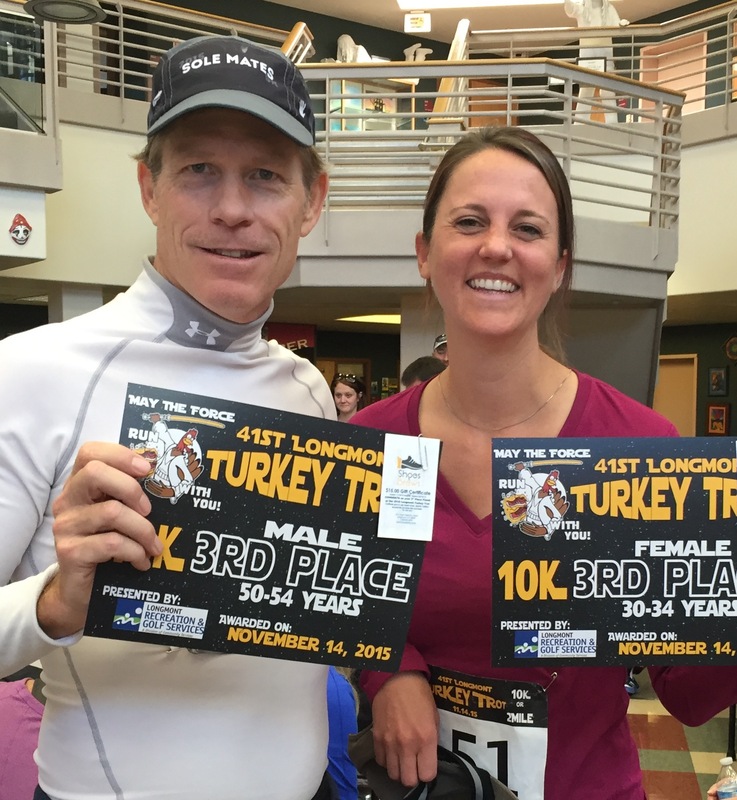 Abbie and I both took 3rd in our respective age divisions. A nice morning on a perfect fall day. 43:13? Aren’t you too old to post those times? Ha!! Awesome race, congrats on third! I finished behind a 61 year old, so apparently not.